What are your thought's about this item? It is useful for acne scars. We plan to sell them in the future. A dermaroller will do the same job though. The most targeted scar treatment is the single needle, allowing you to approach the scar from different angles and using different needling densities. Single-needling requires lots of patience. How soon do you plan start selling DermaStamp? Indeed an excellent tool to treat more serious acne scars on the face. After having been asked repeatedly to start selling dermastamps, we offer the dermastamp specifically for those who do not want to use a dermaroller on larger areas of facial skin but just want to treat a local area with acne scars or wide stretch marks. When they have too many scars to do it efficiently by single needling, a dermastamp fills the niche between single needle and dermaroller. You can of course treat localized acne scar areas with a dermaroller as well but for some people a dermastamp might be easier to maneuver. To sum it up, a dermastamp is ideal when the surface area to treat is a bit too large for a single needle, and a bit too small for a dermaroller. Rolling inevitably results in an elongated treatment area. Stamping treats only a small cirle. You can treat irregular areas of acne scars easier with a dermastamp in some cases. It's all about efficiently targeting the exact area you want to treat. As to your remark on "copycat devices" and your hope about what we sell in our shop - Analizing your previous postings here and that peculiar remark, could you reveal what your stake is in this issue? Are you a co-inventor of the Dermaroller? Are you a microneedling practitioner? Derma Stamp: effective at treating a variety of skin issues such as acne scars, skin discoloration, skin texture, and wrinkles on a localized skin area conveinently. Manuever the device by manually stamping a specific area of skin one at a time. Derma roller: effective at treatment a variety of skin issues such as acne scars, skin discoloration, skin texture, and wrinkles on a localized AND elongated conveinently. Manuever the devic by manually rolling a specific or larger area of skin. Also, you get to roll left to right, up and down, and diagonally in an even manner. It may take some time to acquire the skill to control how much skin you want to prick with the roller. Again, I am sorry that if you find my statement peculiar. It was not intended to be so. I mean no disrespect. 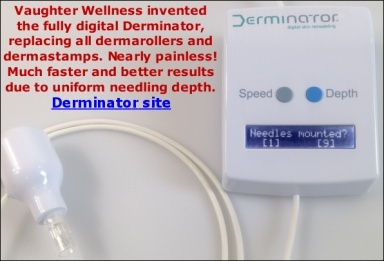 It may be of interest that in fact the dermaroller is the "copycat" device.. The dermastamp was invented first, because it was the simplest method of mass-needling. The dermastamp is still going strong, existing in a variety of sizes, up to sizes that make "stamping" large areas of skin faster than "rolling". The main thing is that one should use the best tool for the job, and there is a place for the dermastamp. We only sell it in the 1.5 mm version because treating acne scars with a shorter length is sub-optimal. So we're not looking just to fill up our store with all kinds of stuff. It took one year before we became convinced that there was a genuine utilization for it. Then we immediately proceeded to add it, because we like to be complete. The same with Retinoic acid, that we recently added. We used to only offer a form of vit. A best suitable for after-care. But there also is the case of vit. A pre-care. Retinoic acid in a cream is better than Retinol acetate in an ointment for that purpose, and vice versa, Retinol acetate in an ointment is much better for post-needling than Retinoic acid. But because we started small (with just 1.5 mm rollers) it takes time to expand, as we have to pay many thousands of dollars in advance for each product we add to our store.. We will add a few more products in the future, based on what we read in the scientific literature. Hyaluronic acid is interesting, for example. So far, we haven't been able to find a good quality, reasonable-priced Hyaluronic acid product suitable for microneedling. Ah! Is that so? The derma stamp came first? Well, my apology, again. I will retract my comment about the "copycat". Thanks for the insight. PS: you should make a thread about the research you have found regarding the use of hyaluronic acid and its relationship/benefit with wound healing or derma rolling. I think that would be fabolous. I have found two You Tube video that showcase derma stamp demonstration. If you stamp skin without scars - for skin rejuvenation - then a single press is more or less sufficient. If you press on scars, wrinkles or stretch marks then multiple presses "stamps" are advisable. Our dermastamp has 35 needles and covers an area of approx 1 cm2 approximately. If you stamp three times, you will get 105 pricks per cm2. Do not stamp three times on exactly the same spot but very slightly move/rotate the stamp with each stamping to ensure you don't stamp into the same holes. How far away are the needles apart? I mean, if they are very close, I think people need to practice to be skillfull at "very slightly move/rotate the stamp". Could be tough for some. They are about 1 mm apart. In fact, the advice to stamp a slightly different spot is superfluous, as the inherent randomness of the action ensures a high statistical probability that the needles don't go into the exact same spot (the skin holes close immediately - before the next stamping). I quoted from the manufacturers' instructions but there is no way you could prick the exact same spot accurate by a 0.01 mm twice in a row - it would be nearly impossible even if you tried to do it on purpose. Great insight from the manufacturer-kudos! Um... when you say the holes close immediately, would that be a separate thing from having pin point bleeding? I mean, I am thinking that if the holes closed that quickly, then there shouldn't be any blood and just redness?